PHILADELPHIA-Wayne White and Anthony Spence, of Miami and Miramar, Florida, respectively, were convicted today of conspiracy to distribute controlled substances and other charges related to their distribution of prescription drugs without valid prescriptions from at least July 2002 through May 2010. Many of White’s and Spence’s online customers were located in the Eastern District of Pennsylvania. Defendant Wayne White was a pharmacist licensed in the State of Florida and the operator of Superior Drugs, which was located in Miami, Florida. White filled orders for prescription drugs – primarily, the controlled diet drug phentermine – for a number of individuals and entities who operated websites which sold these drugs over the Internet, including defendant Anthony Spence. White began filling orders for Internet pharmacies early as 2002; he began filling orders for Spence in late 2003. During the period charged in the indictment, defendant Anthony Spence owned and operated the websites PricebusterRX.com, PricebustersUSA.com, and premiereskincare.com, which sold prescription drugs – the majority of which were controlled substances – over the Internet. Most of the customers of the websites operated by Spence were only required to complete an online questionnaire, or answer questions over the telephone; none were examined by the physicians who issued their prescriptions. Spence paid physicians to review the customers’ responses to the online or telephone questionnaires and to issue prescriptions based solely upon the customers’ responses. In some instances, customers sent Spence reports of physical examinations allegedly conducted by other healthcare professionals. The doctors who approved the prescriptions never communicated with the customers or the people who allegedly examined the customers. Spence paid Superior Drugs, which was operated by defendant Wayne White, to fill these invalid prescriptions and to ship them to his customers. Both defendants were also convicted of conspiracy to introduce misbranded drugs into interstate commerce, which applies to the defendants’ distribution of non-controlled prescription drugs, such as carisoprodol (commonly sold under the trade name of Soma®) and tramadol, (commonly sold under the trade name of Ultram®). In addition, White was convicted of distribution of controlled substances and conspiracy to commit international money laundering. Sentencing hearings for both White and Spence are scheduled for January 30, 2013 before U.S. District Court Judge Juan R. Sánchez. White faces a possible maximum statutory sentence of 81 years’ imprisonment and a fine of $3,350,000. Spence faces a possible maximum statutory sentence of 11 years’ imprisonment and a fine of $350,000. Defendant Carleta Carolina, who is also charged with operating Internet websites and hiring White to fill and ship her orders, is a fugitive. Defendant Michael Gibson, who pled guilty before trial, was a physician licensed in the State of Georgia who issued invalid prescriptions for prescription drugs for customers whom he neither saw, spoke to, or examined. He began working for Spence in 2008, after the doctor whom Spence had previously hired was investigated, and eventually prosecuted, for writing invalid prescriptions and tax evasion. Gibson began working for co-defendant Carleta Carolina in 2009. The sentencing hearing for Gibson is scheduled for January 14, 2013 before U.S. District Court Judge Juan R. Sánchez. The case was investigated by the Diversion and Enforcement Divisions of the Drug Enforcement Administration, the Internal Revenue Service’s Criminal Investigation Division, the Food and Drug Administration’s Office of Criminal Investigations, the United States Postal Inspection Service, Homeland Security Investigations, and the Federal Bureau of Investigation’s New York Division. It is being prosecuted by Assistant United States Attorneys Frank R. Costello, Jr. and Vineet Gauri. ALBANY, NY - Richard S. Hartunian, United States Attorney for the Northern District of New York, and Mark Dragonetti, Special Agent-In-Charge of the New York Field Office of the United States Food and Drug Administration Office of Criminal Investigations announced that MEDISCA, INC., a New York corporation located in Plattsburgh, New York, and its President, ANTONIO DOS SANTOS, age 63, of Montreal, Canada, were sentenced today in federal court in Albany. United States Magistrate Judge David R. Homer sentenced MEDISCA to pay a $10,000 fine, and DOS SANTOS to pay a $5,000 fine. MEDISCA and DOS SANTOS also forfeited and paid $1,763,529, which represented MEDISCA's gross profits from the unlawful drug sales. On October 14, 2011, MEDISCA and DOS SANTOS each pled guilty to the misdemeanor charge of introducing a misbranded drug, specifically somatropin, into interstate commerce using misleading labeling. In entering their guilty pleas last October, DOS SANTOS and MEDISCA admitted that from approximately July 2004 through February 2007, MEDISCA had imported from China and distributed to pharmacies throughout the United States over 1737 grams of somatropin, also known as human growth hormone. They each also admitted that, from at least as early as March 4, 2005 MEDISCA provided promotional literature to the pharmacies claiming that the somatropin was either an FDA-approved drug or from an FDA-approved facility based on the fact that the Chinese manufacturer of the somatropin had obtained from FDA a National Drug Code number for the product. The promotional literature was signed by MEDISCA officers and either provided to MEDISCA sales representatives to distribute to the pharmacies or sent directly to the pharmacies by the MEDISCA officers. The National Drug Code is a number system FDA utilizes to assign a drug listing number to each drug or class of drugs a manufacturer lists and registers with the FDA. However, FDA's regulations explicitly state that "assignment of a NDC number does not in any way denote approval of the firm or its products," and "[a]ny representation that creates an impression of official approval because of registration or possession of a registration number or NDC number is misleading and constitutes misbranding." The case was investigated by the U.S. Food and Drug Administration, Office of Criminal Investigations, New York Field Office and was prosecuted by the United States Attorney’s Office for the Northern District of New York and FDA’s Office of Chief Counsel. A 39-year-old suburban Boca Raton man bought human growth hormone from a company in China and then sold it on a website to people in Palm Beach County, according to a document filed in federal court this week. Michael Degen was charged by information, which suggests that he is cooperating with investigators. Degen and others who were not named in the document bought human growth hormone called GenLei Jintropin, which was manufactured by the Chinese company. The product was not approved by the United States Food and Drug Administration. From August, 2005 to November, 2007, Degen and others knowingly distributed the product and possessed the product with the intention of distributing it to humans for uses “other than the treatment of a disease or other recognized medical conditions authorized by the Secretary of Health and Human Services …,” the document says. Degen and the others paid at least $39,095 to the company in China and sold the product on a website. The product was mainly sold for uses including anti-aging, body building and athletic performance enhancement. One particular time, a conspirator shipped a package containing 100 units of the hormone to a customer. If convicted, Degen will forfeit $82,600, which was already seized from his home in November 2007. JENSEN BEACH — The state Department of Health ordered Treasure Coast Pharmacy to shut down Tuesday evening because it was operating what the department called one of the largest steroid suppliers in the country. Over a six-month period, the pharmacy dispensed almost 11,000 steroid and human-growth hormone orders and 3,700 other addictive prescriptions, such as oxycodone, a Department of Health news release states. Many of those prescriptions came from Internet businesses, which doctors from across the country signed off on without first conducting patient exams, or considering how much of the drug was medically necessary, the release states. No arrests have been made in the federal investigation led by the Drug Enforcement Administration, and the administration did not comment on any future or related investigations, or possible arrests. The DEA led an early morning raid on the Jensen Beach Boulevard pharmacy Tuesday along with several police, sheriff and state trooper units. Law enforcement officials seized dozens of boxes of prescription records before the DEA decided to pull the pharmacy's registration to deal controlled substances legally, and the Department of Health issued an emergency suspension order to shut down the business. The investigation leading up to the raid found that between October 2010 and March 31, the pharmacy, also known as Treasure Coast Specialty Pharmacy Inc., dispensed 10,744 anabolic-androgenic steroids prescriptions and human growth hormone prescriptions. From November 2010 to April 30, it also filled 3,703 Schedule II controlled substance prescriptions, the majority of which were oxycodone, the release states. Doctors received the online orders and signed prescriptions without patient exams or regard for the orders' quantities or dosages, the release states. The signed prescriptions were sent to Treasure Coast Pharmacy through a third party, and then shipped out to patients, the release states. The online businesses recruited physicians to sign prescriptions from the Internet with no patient-doctor relationship, and doctors then accepted payments from the Internet businesses for each steroid and human growth hormone prescription they signed, the release states. On June 15, an undercover DEA agent went with a patient to Treasure Coast Pharmacy after the patient unsuccessfully tried to fill a Roxicodone order at several Palm Beach County pharmacies. One West Palm Beach clinic said that for a fee, the patient could go to the Treasure Coast for his drugs. He paid the fee, and traveled to Treasure Coast Pharmacy where the prescription was filled at no cost, according to the Department of Health order of emergency suspension of permit. The pharmacy specifically filled prescriptions for an Internet steroid and hormone supplier in Kansas, and a clinic based in Tennessee, the suspension order states. The suspension document also includes at least two instances where the doctors self-prescribed steroids, which is against Florida law. Additionally, more than 7,600 of the steroid and human growth hormone prescriptions during the six months investigated were shipped worldwide by Treasure Coast Pharmacy, the release states. The investigation revealed 57 physicians — including 30 in Florida — wrote the 10,744 prescriptions. One Florida doctor wrote 4,430 — or almost half — of the human growth hormone and steroid orders, which mainly were shipped out of state, or internationally to patients in locations such as Guam, the Virgin Islands, Finland and Canada, the release states. And about 1,400 of the 3,703 prescriptions Treasure Coast Pharmacy distributed for controlled substances like oxycodone went to patients living at least 75 miles away from prescribing doctors, the suspension order states. Treasure Coast Pharmacy's co-directors are Peter Deltoro of Palm City, and Richard R. Deltoro of Port St. Lucie, according to Florida Department of State records. Peter Deltoro has an active license as a consultant pharmacist, and has no disciplinary actions or public complaints on record, according to the state Department of Health. The emergency suspension isn't considered a final action, however, and businesses under suspension are entitled to a hearing before final action is taken, the release states. A sign on the business' door Tuesday evening advised patients to contact their doctors if they need prescriptions filled. Study: Sheds 8.9 Pounds &#38; 2 Inches in 28 Days. Can It Work for You? Homeowners in Massachusetts with good credit are using this 1 ti to a 3.2% Refinance Rate. Drivers with no DUI's can get auto insurance for only $9/wk. TRENTON — Law enforcement officials say a new state database that tracks certain prescriptions will help curb the rising abuse of drugs such as narcotic painkillers. The monitoring program, authorized under a 2008 state law, has collected details about 4 million prescriptions since last September for controlled dangerous substances and human growth hormone. Two weeks ago, prescribers and pharmacists became eligible to search the database. Attorney General Jeffrey Chiesa said the program allows state investigators to look for unusual patterns that merit an investigation, such as doctors prescribing unusual amounts of painkillers or, as happened last November and December, a patient who in the span of five weeks obtained more than 2,500 doses of oxycodone and methadone through 14 visits to three different pharmacies. “We’ll now find ourselves analyzing this data, taking action, both in terms of criminal investigations which will come out of this and in terms of, don’t forget, health-care providers will now be in position with their own patients to see certain kinds of behavior so they act in a health-care fashion to address these kinds of addictions,” Chiesa said. “It’s not just about getting criminal action on large-scale distributors, which we will, but it’s also about allowing families who may not have access to that information, because it’s been taken privately and illicitly, to get the treatment that their family members need,” Chiesa said. Toms River resident Meg Dupont-Parisi, whose 21-year-old son Patrick died of a drug overdose in November after getting addicted to oxycodone while in high school, said the program puts in place “imperative steps” that should be augmented by prevention efforts starting in middle school. In 2010, more than 7,200 people were admitted to state-licensed or certified substance abuse treatment centers for prescription painkiller abuse, up by 230 percent since 2005, according to the Substance Abuse and Mental Health Services Administration. Brian Crowell, the special agent in charge of the New Jersey division of the U.S. Drug Enforcement Administration, said abuse of prescription drug medications is the nation’s fastest-growing drug problem and that such overdoses on average kill one American every 19 minutes. He said narcotic painkillers are very similar to heroin chemically and directly impact the market for such illegal drugs, as well. ALBANY, NY - MEDISCA, INC., a New York corporation located in Plattsburgh, New York, and its President, ANTONIO DOS SANTOS, age 63, of Montreal, Canada, each have pled guilty to a one count misdemeanor of introducing a misbranded drug, specifically somatropin, into interstate commerce using misleading labeling, announced Richard S. Hartunian, United States Attorney for the Northern District of New York, and Mark Dragonetti, Special Agent-In-Charge of the New York Field Office of the United States Food and Drug Administration Office of Criminal Investigations. The guilty plea was entered on Friday, October 14, 2011, in United States District Court in Albany, New York before United States Magistrate Judge David R. Homer. Sentencing is scheduled for March 14, 2012, at 1:30 p.m. in Albany, New York. DOS SANTOS faces a maximum term of up to one year in prison, a $100,000 fine, and is subject to up to 1 year of supervised release to follow any period of incarceration, and an order of restitution. MEDISCA faces a maximum term of five years probation, a $200,000 fine, and an order of restitution. In addition, DOS SANTOS and MEDISCA have agreed to forfeit over $1.7 million, which represents MEDISCA's gross profits from the unlawful drug sales. In entering their guilty pleas, DOS SANTOS and MEDISCA admitted that from approximately July 2004 through February 2007, MEDISCA imported from China and distributed to pharmacies throughout the United States over 1737 grams of somatropin, also known as human growth hormone. They each also admitted that from at least as early as March 4, 2005, MEDISCA provided promotional literature to the pharmacies claiming the somatropin was either an FDAapproved drug or from an FDA-approved facility based on the fact that the Chinese manufacturer of the somatropin had obtained from FDA a National Drug Code number for the product. The promotional literature was signed by MEDISCA officers and either provided to MEDISCA sales representatives to distribute to the pharmacies, or was sent directly to the pharmacies by the MEDISCA officers. The National Drug Code is a number system FDA utilizes to assign a drug listing number to each drug or class of drugs a manufacturer lists and registers with the FDA. However, FDA's regulations explicitly state that "assignment of a NDC number does not in any way denote approval of the firm or its products," and "[a]ny representation that creates an impression of official approval because of registration or possession of a registration number or NDC number is misleading and constitutes misbranding." The case was investigated by the U.S. Food and Drug Administration, Office of Criminal Investigations, New York Field Office and is being prosecuted by the United States Attorney�s Office for the Northern District of New York, Assistant U.S. Attorney Thomas A. Capezza and FDA�s Office of Chief Counsel, Associate Chief Counsel Jason Hadges. DENVER, Colo. -- A Colorado Springs Pharmacist was sentenced to 40 months in federal prison for illegally importing and distributing Chinese-made humand growth hormones and for conspiracy to distribute anabolic steroids. Thomas Bader, a licensed pharmacist and former owner and operator of College Pharmacy in Colorado Springs, was sentenced today by U.S. District Court Judge Marcia S. Krieger to serve 40 months in federal prison for the importation and distribution of Chinese-manufactured human growth hormone and conspiracy to distribute anabolic steroids. The defendant, who appeared at the hearing in custody, was remanded. The Court indicated no fine was appropriate because of the Judge's intent to order forfeiture of up to $4.8 million and the pharmacy building. Thomas Bader was indicted by a federal grand jury in Denver on August 8, 2007. A first superseding indictment was obtained on December 5, 2007. A second superseding indictment was obtained on September 9, 2008. Bader was convicted following a 4 week jury trial on February 2, 2010. He was sentenced today, June 10, 2010. According to the evidence presented at trial, Bader used College Pharmacy to receive human growth hormone that had been smuggled into the United States from China and to distribute the hormone as well as testosterone, an anabolic steroid, to customers around the country. The evidence established that the testosterone often went to bodybuilders who had no legitimate relationship with physicians. The jury found Bader guilty of two counts of conspiracy. One of those counts charged that Bader and others conspired to facilitate the sale of the Chinese-made human growth hormone, which was misbranded and not approved by the Food and Drug Administration, knowing it had been imported into the United States in violation of law. The other conspiracy count charged that Bader engaged in a conspiracy to manufacture, distribute, dispense and possess with intent to distribute anabolic steroids. The jury convicted Bader on twenty-seven counts of distribution of human growth hormones, including twenty-three counts that charged the human growth hormone went to minors. The jury also found Bader guilty of one count of facilitating the sale of smuggled human growth hormone and one count of possessing with intent to distribute human growth hormone. Bader was found not guilty of a charge of receiving smuggled goods. In addition, the jury found that assets, including up to $4,800,000 and the building where the pharmacy was located at 3505 Austin Bluffs Parkway, Colorado Springs, should be forfeited to the United States. This case was investigated by the Office of Criminal Investigations of the Food and Drug Administration, and it was prosecuted by Assistant United States Attorneys Jaime Pe�a, Greg Rhodes, Tonya Andrews and James Russell. An Orlando pharmacy once accused of providing performance-enhancing drugs to professional athletes across the country remains under federal investigation in Central Florida. Federal prosecutors in Orlando are asking to review evidence seized as part of a 2007 New York case against Signature Compounding Pharmacy. Charges against company officials later were tossed, but prosecutors recently filed documents in Orlando federal court that state the evidence is related to a "pending grand jury investigation." Signature's attorneys long have fought allegations against the pharmacy and have denied the company was a distribution channel for pro athletes who sought performance-enhancing drugs. Signature made national headlines in 2007 when New York prosecutors painted the company as the hub of a steroid network. In an investigation dubbed "Operation Which Doctor," authorities raided Signature's two Central Florida offices and arrested its top officers. Eventually, nearly two dozen doctors and clinic operators across the country were indicted. But in 2008, a judge threw out the New York charges against the Signature's officers and barred prosecutors from seeking further charges. Since then, Signature's lawyers and Florida prosecutors have continued to argue over the evidence seized from the pharmacy's offices on Kuhl Avenue in Orlando and Aloma Avenue in Winter Park. The evidence was ordered sealed by a circuit court judge. Assistant U.S. Attorney Katherine Ho said at a hearing Wednesday that one aspect of the federal inquiry is to determine to what extent Signature pharmacy's business was focused on steroids and human-growth hormone. The U.S. Attorney's Office already has documents seized from Signature during searches in 2007, which have been kept in a locked agency room, according to court documents. U.S. Attorney's Office spokesman Steve Cole would not discuss the status of the investigation. Meanwhile, Signature's attorneys argue the seized property should be returned the company. This year, Osceola Circuit Judge John Kest ordered the material to be returned to Signature, court documents show. Signature attorney Amy Tingley said nothing has been returned. Company attorneys also say the pharmacy's customers have a right to the privacy of their medical records. Property seized by law enforcement includes every prescription filled by Signature since 2002. In a recent court filing, Signature's attorneys state that neither the company "nor the individuals whose privacy rights are at stake can find any comfort" in the government's claims that it will only disclose the information to the grand jury and government employees. Sarah Lundy of the Sentinel staff contributed to this report. Amy L. Edwards can be reached at aledwards@orlandosentinel.com or 407-420-5735. Jeffrey H. Sloman, United States Attorney for the Southern District of Florida, and David W. Bourne, Special Agent in Charge, U.S. Food and Drug Administration (FDA), Office of Criminal Investigations, Miami Field Office, announced that defendant Arnesto Segredo, 43, of Miami, a former prescription drug wholesaler, was sentenced today by U.S. District Court Judge Alan S. Gold to 70 months in prison. Segredo was convicted in August 2009 of one count of conspiring to divert the prescription drugs Serostim and Nutropin AQ, both human growth hormones, and one count of diverting these human growth hormones in interstate commerce. The two felony charges against Segredo arose from his role in causing his California-based human growth hormone suppliers, all of which were unlicensed to engage in the wholesale distribution of prescription drugs in California, to regularly ship him hundreds of boxes of Serostim, and some Nutropin AQ, from 2000 through the end of 2002. According to evidence admitted at trial and statements made in open court, from 2000 through 2001, Segredo operated Life Extension Institute, a Miami-based prescription drug wholesaler that was never licensed to engage in the distribution of prescription drugs in Florida. He later operated Genendo Purchasing Organization, a Miami-based prescription drug wholesaler that secured a Florida license in July 2001. The Prescription Drug Marketing Act (�the Act�) was passed by Congress to prevent prescription drug diversion and the distribution of counterfeit, stolen, or substandard drugs. The Act requires that every wholesaler that engages in wholesale distribution of prescription drugs in interstate commerce to be licensed by a State licensing authority before engaging in the wholesale distribution of prescription drugs in interstate commerce. Serostim is an injectable drug approved by the FDA for the treatment of AIDS-wasting syndrome in HIV-infected patients, and Nutropin AQ is an injectable drug approved by the FDA for the treatment of growth hormone deficiency, including children with short stature. A significant portion of the Serostim that Segredo caused to be distributed originated from AIDS patients in California who obtained their Serostim from the Medi-Cal Medicaid program. Evidence presented in court during several sentencing hearings before Judge Gold showed that the Nutropin AQ distributed by Segredo was counterfeit. Evidence showed that the counterfeit Nutropin AQ entered the prescription drug supply chain and was ultimately distributed, causing bodily harm to a child. Although the evidence did not show that Segredo engaged in the intentional distribution of counterfeit medication, the Court found that this was a foreseeable risk that could result from the illegal diversion of these drugs. Mr. Sloman commended the investigative efforts of the FDA�s Office of Criminal Investigations. The case was prosecuted by Assistant U.S. Attorney Jose A. Bonau of the Economic and Environmental Crimes Section, and Special Assistant U.S. Attorney Michael Varrone, a trial attorney with the FDA�s Office of Chief Counsel. 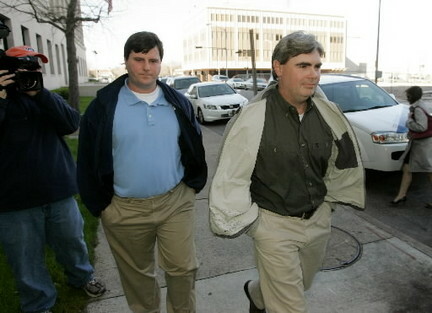 Jason R. Kelley and A. Samuel Kelley leave the federal courthouse in Mobile in this file photo. The two men were convicted on Feb. 8, 2010, along with three other defendants of conspiring to illegally sell steroids with no valid medical reason. MOBILE, Ala. -- A federal jury in Mobile on Monday found three owners of a Mobile pharmacy, their supervising pharmacist and the owner of a Colorado anti-aging clinic were part of a far-reaching steroids conspiracy. But the jurors acquitted three pharmacists at Applied Pharmacy Services and an investor in the Internet-based anti-aging clinic, Infinite Health. Lead prosecutor Donna Dobbins said the defendants will also forfeit $2.6 million in drug profits, along with the office building where the compounding pharmacy was located, on International Drive near Bel Air Mall, before an August 2006 raid by the Drug Enforcement Administration. Snapshots of the five defendants who were convicted Monday of steroids charges. A. Samuel Kelley II, 43, of Mobile. The president and CEO of the now-defunct Applied Pharmacy Services, he was convicted of 130 counts, including drug conspiracy, drug distribution, distribution to a person younger than 21 and money laundering. Jason R. Kelley, 32, of Mobile. The secretary and part owner of Applied Pharmacy, he was convicted of 127 counts, including drug conspiracy, drug distribution, distribution to a person younger than 21 and money laundering. Jodi C. Silvio, 50, of Baton Rouge, La. The treasurer of Applied Pharmacy and a fill-in pharmacist there, he was convicted of 60 counts, including drug conspiracy, drug distribution and money laundering. J. Michael Bennett, 43, of Mobile. The supervising pharmacist at Applied, he was convicted of five counts, including drug conspiracy, drug distribution and distribution to a person younger than 21. Brett W. Branch, 41, of Eaton, Colo. The owner of Infinite Health, he was convicted of 46 counts, including drug conspiracy, drug distribution, distribution to a person younger than 21 and money laundering conspiracy. The jury reached its verdict after deliberating for parts of four days, following a monthlong-plus trial. Several doctors, who previously had pleaded guilty to steroids charges, testified that they colluded with Infinite Health owner Brett W. Branch to supply steroids to bodybuilders, athletes and other healthy customers. Prosecutors submitted dozens of taped phone conversations to back up allegations that Applied Pharmacy was in on the conspiracy. "These defendants were charged with being a part of a nationwide conspiracy to distribute anabolic steroids and other drugs to people throughout the country," Dobbins said. "And daily, they put at risk the health and safety of these people, many of whom were teenagers and people under 21 -- all for money." A preliminary calculation of advisory sentencing guidelines suggests that the felons face anywhere from about five years in prison to, in one case, more than 12. The pharmacy's owners and employees argued that they believed the prescriptions -- signed by licensed physicians -- were valid. "It's a tough loss," said Richard Jaffe, an attorney who represented Applied President and Chief Executive Officer A. Samuel Kelley II. Jaffe said he will take a thorough look at the trial record in the coming weeks. "We first of all have to digest it," he said. "It's an emotional explosion to the lives of our clients." In addition to Kelley and Branch, the jury convicted Kelly's cousin, Jason R. Kelley, the secretary and part owner of Applied; Jodi C. Silvio, another part owner; and J. Michael Bennett, who was the supervising pharmacist. Three pharmacists who worked for the compounding pharmacy, J. Mallory Mallon, Roger A. Everett and Robin K. Kelly, won acquittals. Ronald E. Winter, a former Colorado sheriff's deputy who was a customer of Branch's and ended up becoming an investor, also was found not guilty. According to testimony at the trial, Branch and owners of other clinics advertised in gyms, health clubs and other spots to lure customers all over the country. One dealer had customers in 41 states. The business owners then recruited doctors to sign off on steroids prescriptions, in some cases without even seeing the customer. The business owners then faxed the orders to Applied Pharmacy, which filled thousands of doses of powerful anabolic steroids -- including drugs that have been approved by the Food and Drug Administration only for veterinary purposes, such as fattening livestock. At one point, witnesses testified, the pharmacy was shipping as many as 250 packages a day. The pharmacy's roster of customers included prominent athletes, such as former baseball slugger Jose Canseco and pro wrestler and former Olympic gold medalist Kurt Angle. But Dobbins insisted Monday that the case was not about them, but the many ordinary people -- including teenagers -- who risked side effects ranging from severe acne to shrunken testicles. "It's been a concerted effort among the Department of Justice to prosecute these cases," she said. "There have been others throughout the country, in Colorado and Seattle and in California and in Florida." Defense attorneys vowed to appeal even as they begin preparing for sentencing hearings scheduled for June and July. "Certainly, we haven't gotten a chance, at this point, to identify all the appeal issues, yet," said attorney Dennis Knizley, who represented Branch. "We'll be doing that over the next few days." One more steroids trial looms in Mobile. Jesse S. Haggard, an alternative medicine practitioner from Arizona who was named in the indictment, will be tried in April. Three more doctors, Kenneth Olds, Kelly Tucker and Pamela Pyle, pleaded guilty in a steroid conspiracy involving the compounding pharmacy Applied Pharmacy Services (APS) (&#8221;3 more docs admit guilt in steroids case,&#8221; April 30). Drs. Kenneth M. Olds and Kelly W. Tucker of Greeley, Colo., agreed to plead guilty in Mobile to dispensing anabolic steroids outside the course of professional practice. Greeley is also home to another who in January pleaded guiltyto withholding information about illegal steroids prescriptions. Dr. Pamela Pyle, a Myrtle Beach, S.C., osteopath, also admitted to the withholding offense, known as misprision of a felony. The indictments were expected after Assistant U.S. Attorney Donna Dobbins requested a postponement in the sentencing of their APS co-conspirator Scott Corliss last week. Olds and Tucker had previously been named in court documents as co-conspirators in the APS steroid scandal. We have not previously seen a link to Dr. Pamela Pyle. MESO-Rx expects all four doctors who have pleaded guilty in the steroid conspiracy will cooperate with federal prosecutors in their pursuit of Applied Pharmacy Services Inc. and their owners Samuel Kelley and Jason Kelley. Prosecutors allege that Applied Pharmacy Services was party to a conspiracy involving the distribution of anabolic steroids to individuals without a legitimate medical need. Working in concert for their mutual profit, these doctors, pharmacy owners, pharmacists and sales representatives removed the word controlled from drug shipments; U.S. Attorney Deborah Rhodes said in a written statement. They made sure that anabolic steroids were readily available to any person willing to pay for them, regardless of any legitimate medical need. Practices that have troubled prosecutors include the distribution of trenbolone acetate which has no accepted medical application in humans and the dispensing of steroids to patients as young as 19 years old. Applied Pharmacy no longer offers pharmaceutical quality anabolic steroid and hormone preparations; they have stopped production of all anabolic steroids as a result of DEA pressure and the ongoing federal steroid investigation. 1. The Federal Food, Drug, and Cosmetic Act prohibits knowingly distributing or possessing with the intent to distribute human growth hormone for any use in humans other than for the treatment of a disease or other recognized medical condition, where such use has been authorized by the Secretary of Health and Human Services under 21 U.S.c. � 355 and pursuant to the order of a physician. 21 U.S.C. � 333(e). The Food and Drug Administration (FDA) has approved human growth hormone ("HGH") for the following uses: short stature in children with growth hormone deficiency, ideopathic short stature in children, short stature in children with Turner or Prader-Willi syndrome, short stature in children with chronic renal insufficiency, adults with biochemically documented growth hormone deficiency (GHD) diagnosed either in adulthood or childhood, adults with wasting disease associated with AIDS, and adults with short bowel syndrome. HGH has not been approved for use in any anti-aging, body-building, or weight loss treatments. HGH has not been shown to be safe and effective for the enhancement of athletic performance. 2. On March 13, 2006, the COMPOUNDING CENTER's website read to include, "Human Growth Hormone is one of many endocrine hormones like progesterone, estrogen, testosterone, and DHEA, which declines (sic) in production as we age. Many ofthese hormone (sic) can be replaced to help deter the effect of aging. Human Growth Hormone reaches beyond the scope of these hormones alone. Studies show that it can help to reverse a wide range of signs and symptoms associated with "AGING". The Compounding Center, working with your physician, can supply many different forms of anti-aging products." 3. Dr. F was a licensed medical doctor practicing in the State of Texas. Dr. F was not a board certified endocrinologist. Dr. F created, or commissioned the creation of, a pamphlet describing his medical clinic. This pamphlet described the function of the clinic as anti-aging, performance enhancement and life extension. The pamphlet gave no indication that Dr. F. engaged in the treatment of a disease or other recognized medical condition that would allow the distribution or possession with the intent to distribute HGH. On or between December 3, 2001 and July 6, 2004, Dr. F purchased $144,506 worth of Saizen. These 52 separate purchases were made from the wholesale department of the COMPOUNDING CENTER. 4. Dr. G was a licensed medical doctor practicing in the State of Arizona. Dr. G was not a board certified endocrinologist. Dr. G's practice was exclusively centered on anti-aging medicine and advertised the practice as such through, among other things, signage and a website. Dr. G did not engage in the treatment of a disease or other recognized medical condition that would allow the distribution or possession with the intent to distribute HGH. On or between April 1, 2002 and September 9, 2004, Dr. G purchased $216,003 worth of Saizen. These 41 separate purchases were made from the wholesale department of the COMPOUNDING CENTER. 5. Dr. H was a licensed medical doctor practicing in the State of California. Dr. H was not a board certified endocrinologist. Dr. H. maintained a website containing quotes from Dr. H advocating the prescribing and dispensing of human growth hormone for anti-aging, longevity ~ and performance and life enhancement. The website, among other things, listed Saizen prices and availability for purchase from the clinic. Nowhere in the website was there an indication that Dr. H. engaged in the treatment of a disease or other recognized medical condition that would allow the distribution or possession with the intent to distribute human growth hormone. On or between May 8, 2002 and February 8, 2006, Dr. H. purchased $140,270 worth of Saizen. These 73 separate purchases were made from the wholesale department of the COMPOUNDING CENTER. 6. Dr. I was a licensed medical doctor practicing in the State of New York. Dr. I was not a board certified endocrinologist. Dr.! maintained a website describing his medical practice to be focused on anti-aging, life extension, performance enhancement, and disease prevention. Nowhere in the website was there an indication that Dr. I engaged in the treatment of a disease or other recognized medical condition that would allow the distribution or possession with the intent to distribute human growth hormone. On or between December 12, 2001 and October 13, 2003, Dr. I purchased $80,493 worth of Saizen. These 41 separate purchases were made from the wholesale department of the COMPOUNDING CENTER. 7. Confidential Informant 1, ("CS 1") was a physician practicing in the State of Arizona. CS 1 was not a board certified endocrinologist. CS 1's practice was exclusively centered around anti-aging. On or between December 10, 2001, and August 27, 2004, CS 1 purchased $20,794.25 worth of Saizen. These 37 separate purchases were made from the wholesale department of the COMPOUNDING CENTER. a. THE COMPOUNDING CENTER advertised through, among other ways, its website offering its services as a supplier of "anti aging products". The website specifically touted the impermissible use of HGH as being effective to reverse a wide range of signs and symptoms associated with aging. c. Through their advertisements and solicitations, the COMPOUNDING CENTER was able to attract the attention of certain doctors whose practices primarily centered for the purported treatment of anti-aging, performance enhancement and life extension. d. The COMPOUNDING CENTER and SEAN SHAFFER sold between approximately 1.2 million to 8.2 million dollars worth of Saizen to doctors, among others, whose practices primarily centered on the purported treatment of anti-aging, performance enhancement and life extension. Nowhere was there an indication that these doctors engaged in the treatment of a disease or other recognized medical condition approved by the FDA that would allow the distribution or possession with the intent to distribute human growth hormone. DENVER � U.S. District Court Judge Marcia S. Krieger this week ordered College Pharmacy, Incorporated, a Colorado Springs corporation, to forfeit $3,500,000, to the United States government, U.S. Attorney Troy A. Eid announced. The judgment was part of a civil settlement agreement reached between the government and the current owners of the pharmacy. The forfeited money represents the ill-gotten proceeds the business made from their criminal conduct � specifically the illegal importation, sale and distribution of hGH, human growth hormone. College Pharmacy as a corporation, and three individuals who were owners, operators, employees or agents of the business, were indicted by a federal grand jury in Denver on August 8, 2007. Of the three defendants, Thomas Bader, Kevin Henry, and Bradley Blum, only one, Blum, has pled guilty and been sentenced. The other two await trial, which is scheduled for April 2009. Blum was sentenced this week by Judge Krieger to serve 2 years of probation, of which the first 6 months are to be spent in home detention. Blum was also ordered to pay a $10,000 fine. On August 21, 2008, the U.S. Attorney�s Office filed a verified Complaint for forfeiture. A settlement was later reached between the two parties. Judge Krieger signed the final order and judgment, codifying the settlement, on December 17, 2008. The agreement states that the parties agreed that the defendant, College Pharmacy, will pay $3,500,000 in lieu of the forfeiture of the pharmacy�s property. The agreement reached yesterday addresses issues involving the previous owners of the pharmacy, who illegally imported and sold Chinese hGH. The pharmacy is now under new ownership. �Happily, crime still doesn�t pay,� said United States Attorney Troy A. Eid. The criminal case was investigated by the Food and Drug Administration, Office of Criminal Investigations (FDA-OIC), the Drug Enforcement Administration (DEA), the Federal Bureau of Investigation (FBI), and Immigration and Customs Enforcement (ICE). The cases are being handled by Assistant U.S. Attorneys Jaime Pena, Gregory Rhodes, James Russell and Tonya Andrews. Baltimore, Maryland - Bradley C. Blum, age 36, of Houston, Texas, pleaded guilty today to conspiracy to distribute human growth hormone, announced United States Attorney for the District of Maryland Rod J. Rosenstein. According to the plea agreement, during June, 2006, Bradley Blum identified himself as the North American agent for GeneScience China (�GeneScience�). According to it�s internet website, GeneScience is a manufacturer of human growth hormone located in Changchun Jilin Province in the People�s Republic of China. FDA records indicate that there is no approved drug application for any human growth hormone (HGH) drug product held by GeneScience and the FDA has not approved any manufacturer based in China for the importation into or distribution of its product in the United States. Bradley Blum is not a medical doctor, and as such is not authorized to distribute HGH in the United States. Since 2004, GeneScience has allegedly endeavored to illegally import/smuggle into the United States large amounts of HGH. It allegedly offered its customers �insurance� against U.S. Customs seizure at the rate of $3/vial, so that if a shipment of GeneScience-produced HGH were seized by the FDA or U.S. Customs before delivery to a U.S. customer, GeneScience would allegedly reship the order at no further cost to that customer. More than 25 parcels containing HGH have been seized. Two of the HGH parcels were addressed directly to Bradley Blum and indicated that they contained �glassware samples.� Thirteen of the parcels had a U.S. contact phone number which is a cellphone subscribed to by Bradley Blum. Based on seized records of e-mail traffic between Blum and an individual in Maryland, investigators learned that HGH customers contacted Blum via e-mail and placed orders for HGH. Blum then responded to the customer�s e-mail quoting a price, typically $2.30 - $2.50 per international unit (an international unit equals three milligrams of a pharmaceutical) and directed the customers to send the money via Western Union to certain persons in China. Once the money transfer occurred, the customer would e-mail Blum with the particulars of the transfer and the control number assigned to the transaction by Western Union. The customer would also give Blum the name and address to which the HGH should be shipped. Blum then relayed that information to GeneScience who would allegedly advise Blum of the parcel service through which the product was shipped and the tracking numbers for the parcels. Based on the records of e-mail communications between GeneScience and Blum, it appears that since 2004 over 50 deliveries of HGH manufactured by GeneScience and facilitated by Blum were made to over 15 individuals in Maryland. The same records indicate that Blum and GeneScience engaged in over 600 transactions involving at least 100 individuals located in the United States and Canada between November, 2004 and December, 2006. As an example of the volume of business during the period September, 2004 - August, 2005, e-mail records between Blum and GeneScience indicate that over $1,500,000 was transferred to GeneScience by customers who illegally obtained HGH from GeneScience through Blum. Blum faces a maximum sentence of five years in prison, followed by three years of supervised release and a $250,000 fine. U.S. District Judge Andre M. Davis has scheduled sentencing for October 10, 2008. A federal grand jury in Rhode Island has charged Genescience Pharmaceutical Company, the company�s CEO, Lei Jin, and three other men with participating in an international trafficking conspiracy in which millions of dollars worth of human growth hormone (HGH) was smuggled into the United States and other countries. This Organized Crime Drug Enforcement Task Force case is part of �Operation Raw Deal,� an international investigation targeting the illegal manufacturing and trafficking of anabolic steroids and its raw materials, mainly from China, along with the human growth hormone (HGH) and the insulin growth factor (IGF) markets. United States Attorney Rod J. Rosenstein thanked the Food and Drug Administration�s Office of Criminal Investigations for their investigative work. Mr. Rosenstein commended Assistant United States Attorney Philip S. Jackson, who is prosecuting the case. Applied Pharmacy owners Jason R. Kelley (l.) and Samuel Kelley leave the federal courthouse on Thursday in downtown Mobile, Ala. The owners of an Alabama pharmacy that allegedly sold performance-enhancing drugs to Jose Canseco, John Rocker, Evander Holyfield and other athletes were among the 12 people indicted by a federal grand jury for their role in what court documents describe as a $4 million steroid ring that operated in at least 10 states, including New York and New Jersey. The superseding indictment was handed down in December but was not unsealed until Thursday, when six of the defendants linked to Applied Pharmacy Services appeared in U.S. District Court in Mobile for a hearing. Applied's owners - Samuel Kelley, Jason R. Kelley and Jodi Silvio - are scheduled to return to court for an arraignment next week. The indictment does not identify company clients, but Drug Enforcement Administration agents who raided the Mobile compounding pharmacy in 2006 found records that indicated Canseco, Rocker, Holyfield and more than a dozen other athletes had obtained performance-enhancing drugs from Applied. "Several of the steroids were powerful veterinary steroids [STANOZOLOL] approved for use in animals such as cattle and horses - but not human beings," the indictment said. "Some of the sales of anabolic steroids were to teenagers and young persons under the age of 21. Daily, these defendants put the health and safety of hundreds of people at risk for the sake of millions of dollars." The 2006 Mobile raid was the first action in what would become known as Operation Which Doctor, the multistate investigation of illegal Internet drug distribution led by Albany County District Attorney David Soares. Seventeen doctors and wellness center executives pleaded guilty to charges from Operation Which Doctor, and many of them agreed to testify against Signature's operators. But Albany County Judge Stephen W. Herrick threw out the indictment in 2008 and barred prosecutors from bringing the case to a new grand jury, Herrick ripped prosecutors for the way they handled the case, saying the indictment and the instructions to the grand jury considering the case were confusing. Federal authorities in Alabama describe one of the 12 Applied defendants, an Arizona naturopathic doctor named Jesse Haggard, as a fugitive. Haggard is idenfitied as a steroid dealer in the indictment. Last year, the Daily News reported that one of the businesses targeted by the Albany probe sent a package containing the anabolic steroid oxymethelone and testosterone cypionate to Haggard's Phoenix-area clinic. The package was addressed to Kevin Schexnider, who was a co-owner of a now-closed Houston-area gym. Schexnider's partner was a trainer named Kelly Blair, a former schoolmate and relative-through-marriage of Andy Pettitte. Pettitte told congressional investigators last year that he obtained human growth hormone from his father Tom. The News, meanwhile, reported that Tom Pettitte obtained the HGH from Blair. In an interview last year, Haggard acknowledged that Schexnider was a patient but would not talk about the package sent to his clinic. A New York pharmacy linked to a widening probe of human growth hormone in sports was raided on Tuesday by state investigators who seized enough raw powder to make nearly a million HGH doses, according to the officials involved. The raid of Lowen's Pharmacy in Bay Ridge, Brooklyn, was the second in five months. In May, investigators with the New York Bureau of Narcotic Enforcement found employees mixing $200,000 worth of steroids and growth hormone in a back room. On Tuesday, they found 90 grams of raw human growth hormone, worth an estimated $7.2 million. Also found were kilogram quantities of three popular steroids: testosterone, nandrolone and stanazolol. "This is much bigger than what we thought," said Mark Haskins, an investigator with the state's Bureau of Narcotic Enforcement. The investigators are the same ones who have been working with the Albany (N.Y.) District Attorney's office in its probe of Florida's Signature Pharmacy. In recent weeks, Major League Baseball officials have met with Toronto third baseman Troy Glaus and St. Louis outfielder Rick Ankiel, whose names surfaced in connection with that investigation, to discuss reports that they received growth hormone from Signature. On Tuesday, Haskins and officers from the New York Police Department carted out boxes filled with prescriptions from many of the same "wellness clinics" that received prescriptions filled by Signature. One of the roughly 20 boxes carted away contained prescription requests from The Health and Rejuvenation Center, a clinic in Palm Beach Gardens, Fla., where the New York Daily News reported that Ankiel went to get his HGH. "It's hard to believe that all the growth hormone we found was meant for the people of Bay Ridge, Brooklyn," Haskins said. The records are being turned over to the Brooklyn District Attorney's Office for further investigation. Twenty computers also were seized by the NYPD. The raid began on Monday evening. By Tuesday afternoon, the investigators obtained a warrant to search an office above the pharmacy that was used by its vice president, Edward Letendre. That was where they found the hidden cache of growth hormone. The growth hormone seized from Lowen's on Tuesday was imported from China. Although the federal Food & Drug prohibits the sale of Chinese-made HGH, it remains popular in the U.S. because of its high quality and low price. In a separate case, a federal grand jury in Rhode Island grand jury indicted China's leading manufacturer of growth hormone last month. Letendre was taken into custody on charges of criminal diversion of prescription medicines. Efforts to contact him Tuesday were unsuccessful. Lowen's is housed in a building owned by Julius Nasso, a pharmacist-turned-movie producer who was sentenced to prison in 2003 for conspiring with Gambino crime family members to extort money from the actor Steven Segal. His son, Julius Jr., is a part owner of Lowen's. Throughout Tuesday, customers who tried to enter the pharmacy found the door locked. A hastily scribbled sign read: "Due to mechanical problems, we are temporarily closed." Kevin J. O�Connor, United States Attorney for the District of Connecticut, and Kimberly K. Mertz, Special Agent in Charge of the Federal Bureau of Investigation, today announced charges that have been brought against six individuals as a result of Operation Phony Pharm, an undercover investigation targeting the illegal sale of anabolic steroids, human growth hormone, and other controlled substances over the Internet. In April 2006, the FBI�s Healthcare Fraud Unit in the District of Connecticut, initiated Operation Phony Pharm. Using several sophisticated investigative techniques, this initiative, which has included the assistance of the United States Postal Inspection Service, the Food and Drug Administration�s Office of Criminal Investigations, and the Drug Enforcement Administration, has targeted web sites and individuals who are selling Schedule II and III pharmaceuticals over the Internet without a doctor�s consultation or a legitimate legal written prescription. Operation Phony Pharm also sought to identify and close down underground laboratories in the U.S. that are making these drugs from raw materials obtained from outside the U.S. In an Indictment unsealed on Friday, September 21, EDWIN F. PORTER, 41, of Chandler, Ariz.; MATTHEW J. PELTZ, 36, of Chandler, Ariz.; TYLER J. LUNN, 27, of Phoenix, Ariz.; and WALTER T. COREY, 37, of Cherleroi, Penn., are each charged with one count of conspiring to distribute anabolic steroids, and two counts of distribution of anabolic steroids. The Indictment alleges the defendants purchased raw steroid powder from China, manufactured anabolic steroids in home laboratories in both oral and injectable form, and distributed them to customers around the country through a MySpace.com profile and an Internet web site they created, www.anabolic-superstore.com. If convicted, PELTZ, LUNN and COREY face a maximum term of imprisonment of 15 years and a fine of up to $750,000. As PORTER has also been charged with one count of making a false statement to the FBI during the course of this investigation, he faces a maximum term of imprisonment of 20 years and a fine of up to $1,000,000. Also on Friday, BRIAN S. TOMPKINS, 29, of Deltona, Fl., pleaded guilty in Hartford to one count of distribution of anabolic steroids. TOMPKINS admitted that, from September 2006 to July 2007, he distributed anabolic steroids by mail to individuals who contacted him through his MySpace.com profile. He further admitted that, in July 2007, he purchased two kilograms of steroid powder from a supplier in China. Earlier today, ALAN R. BLAIR, 52, of Wilton, Conn., pleaded guilty in Hartford to one count of distributing Human Growth Hormone without a prescription. BLAIR admitted that, from approximately November 2004 to April 2007, he distributed HGH to customers throughout the world using the web site www.jintropin.com. The HGH was shipped directly to BLAIR�s customers from a supplier in China. As part of his guilty plea, BLAIR has agreed to forfeit to the Government approximately $260,000 of illegal proceeds generated as a result of his operation. TOMPKINS and BLAIR are each scheduled to be sentenced by United States District Judge Christopher F. Droney in December, at which time they face maximum terms of imprisonment of five years and fines of up to $250,000. In December 2006, as a result of Operation Phony Pharm, a seventh defendant, Hiroshige Cranney, 25, of San Francisco, Calif., was charged with selling anabolic steroids through the Internet website www.sell.com. The steroids, which include dianabol, winstrol, deca-durabolin, anavar, testosterone, anadrol, and turanabol, were sold to buyers in Connecticut and around the country. The case was transferred to the Northern District of California, and, in August 2007, Cranney pleaded guilty to one count of illegal sale of anabolic steroids. During the course of Operation Phony Pharm, the FBI became aware of Operation Raw Deal, an international investigation led by the Drug Enforcement Administration that was targeting the underground manufacture, conversion and trade of anabolic steroids. Since that time, Operation Phony Pharm and Operation Raw Deal have provided mutual assistance as these investigations have evolved. Operation Raw Deal has focused on raw material manufacturers/suppliers in China and other countries; underground anabolic steroid laboratories in the United States, Canada and Mexico; numerous U.S.-based websites distributing materials, or conversion kits, necessary to convert raw steroid powders into finished product; and Internet bodybuilding discussion boards that are the catalysts for individuals to learn how to illicitly use, locate and discreetly purchase performance enhance drugs, including anabolic steroids. Many of the underground steroids labs targeted during this investigation advertise and are endorsed on these message boards. Today, the United States Department of Justice announced that Operation Raw Deal, together with the charges announced today in Connecticut, represents the largest steroid enforcement action in United States history. As part of Operation Raw Deal, 143 federal search warrants were executed on targets nationwide, resulting in 124 arrests and the seizure of 56 steroid labs across the United States. In total, 11.4 million steroid dosage units were seized, as well as 242 kilograms of raw steroid powder of Chinese origin. As part of Operation Raw Deal, $6.5 million also was seized, as well as 25 vehicles, three boats, 27 pill presses, and 71 weapons. Enforcement activity took place in 27 states. Approximately 50 people were arrested and 61 federal search warrants were executed on targets nationwide during the operation�s final takedown, which began on Sept. 14, 2007. The U.S. operation took place in conjunction with enforcement operations in Mexico, Canada, China, Belgium, Australia, Germany, Denmark, Sweden, and Thailand. According to the charges filed in connection with these investigations, worldwide manufacturers of the raw materials needed for steroids use websites to market their products and even provide guidance to potential customers. Steroid Internet message boards and chat rooms also use the latest technology in an effort to keep their business transactions � and those of their customers � anonymous. These web sites, chat rooms, and message boards also provide information about how to convert the raw material into finished steroid product and boast of their ability to resist law enforcement scrutiny. In addition, these sites promote and often sell �conversion kits� that allow customers to convert raw materials into steroids themselves from home. Besides steroids, many websites targeted also offered other dangerous drugs and chemicals such as ketamine, fentanyl, ephedrine, pseudoephedrine, and GHB. �The FDA Office of Criminal Investigations takes this illegal conduct very seriously and fully supports the investigation and ultimate prosecution of these profiteers who endanger the public by formulating and selling unapproved illegal drugs, even when those who would be endangered are willing participants. These buyers are solely motivated by a desire to gain an unfair competitive advantage by using illegal performance-enhancing substances and the sellers are not concerned with the buyers' health but with making money,� said Terry Vermillion, Director of the FDA Office of Criminal Investigations. U.S. Attorney O�Connor stressed that an indictment is only a charge and is not evidence of guilt. Each defendant is entitled to a fair trial at which it is the Government�s burden to prove guilt beyond a reasonable doubt. Operation Phony Pharm is being prosecuted by Assistant United States Attorney Edward Chang of the U.S. Attorney Office�s Computer Hacking and Intellectual Property Unit.